In Redmond, Washington, a banshee was heard keening in the night. This morning, a somber quiet fell upon the Skype offices in Luxembourg. A chill wind rises, and grim tidings are on the lips of videoconferencing companies the world over. 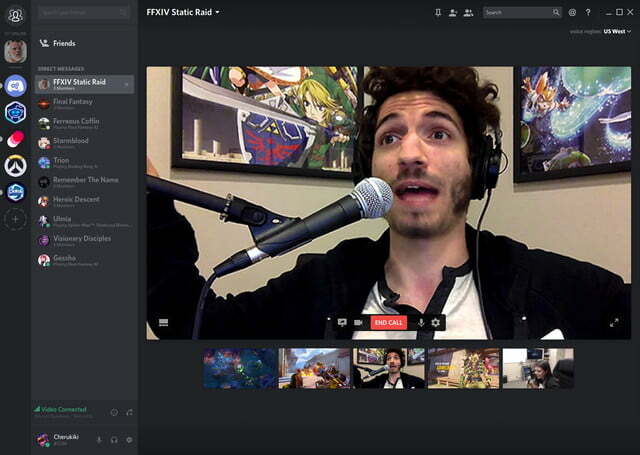 Discord’s video chat functionality is here, and it’s fantastic. Clad in glimmering armor, violet banners snapping in the wind, the Discord development team gathers. They come bearing video chat and screen sharing, two features which will be rolling out to 5 percent of registered Discord users today, with that pool expanding in the coming months. We sat down for a hands-on demo of new Discord features which could — as prophecy has foretold — put an end to Skype’s reign of terror. What sets Discord apart from the competition is its emphasis on real-world use. Okay, maybe we’re being dramatic. But who likes using Skype or Zoom? Nobody, that’s who. Not because there’s anything wrong with the branding, or the companies behind them. It’s just that neither app provides a good user experience, and both apps are at times reluctant to facilitate video conferencing — their sole purpose in this world. 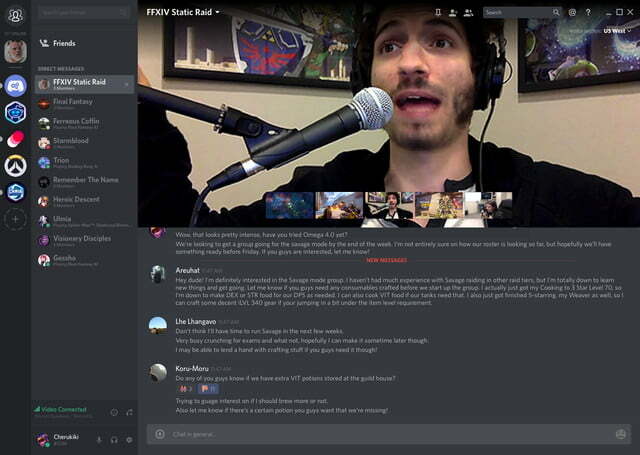 Discord aims to change all of that with a pair of new features, video chat and screen sharing. What sets Discord apart from the competition here is its emphasis on real-world usability. First up, video chat. All you do to get started is create a group direct message, and click the video icon. That’s it. Everyone in the chat will see the video, and currently up to ten users can video chat at once — but Discord CTO Stansislav Vishnevskiy warns quality will take a hit after the first five users. Limiting the number of callers is a necessity at this point, in part because of the way Discord handles video chat. It puts a priority on security. The Discord team has done the impossible: They’ve made a video chat app that offers a seamless user experience. By using a client-server architecture, you’ll connect to the server to communicate, rather than connecting directly to everyone else, which can sometimes compromise security or privacy. A client-server setup prevents that, with Discord’s servers acting as the intermediary. The same is true for the other big feature in today’s Discord update — screen-sharing. 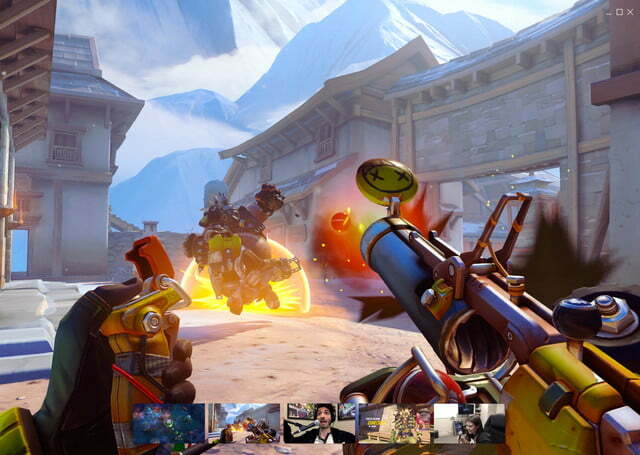 Anyone can now video chat with one another, and they’ll be able to stream their gameplay to small groups of friends. It’s not unlike Steam’s screen-sharing functionality. During our hands-on it was quick, crisp, and very easy to setup — which sets it apart from Steam’s often-temperamental broadcasting feature. 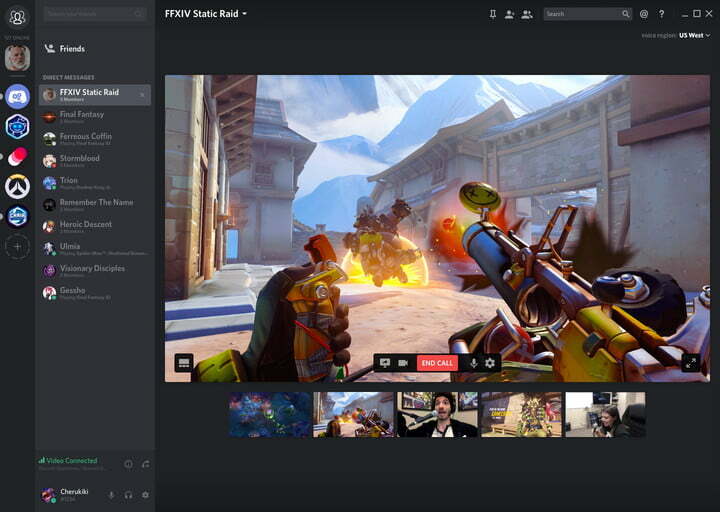 You can even switch to screen-sharing during an existing video chat, to show friends what you’re currently playing. “Basically, the source can come from your webcam or your screen, and you can flip between them seamlessly during a call,” said the Discord team. If you’ve ever tried to set up a video call in Skype, Facetime, Zoom, or any of the other video chat apps and services out there, you’re well aware of what a pain it can be. Adding participants can mean having to quit and re-start the video call, and you may have to send around a long conference call code to make sure everyone can connect. Then, once connected, reliability is an issue. It’s not great. Discord’s thinks it has the superior option, but knows there’s a lot of technical hurdles that make video conferencing a difficult feature to handle. Simplicity is the real accomplishment here. There’s an elegance to Discord’s solution we haven’t seen elsewhere, and that’s the component that has been missing from other video chat and teleconferencing solutions. Just getting a three-way video call up and running with an app like Skype, Facetime, or Zoom can be an exercise in frustration. Getting it right on the first go is a small miracle. Discord eliminates that uncertainty by streamlining the whole process. Just click. That’s it. 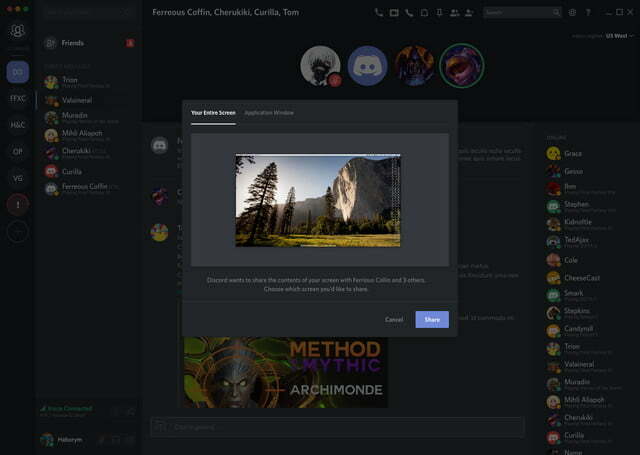 Discord changed the game for voice chat apps by offering a single-click solution, and it’s that design philosophy which makes the new video chat functionality stand apart from the rest. You don’t need to create a separate contact list, or juggle a bunch of separate apps and web services. You just fire up Discord, use your existing contact list, and drop into a call. It’s that simplicity that made Discord easy to recommend on our list of the best chat apps. That’s the simple reason why Skype, Zoom, and others should be worried. Discord’s solution is better. Full stop. People will almost always migrate to the app with the best service — and as of today, that’s Discord.